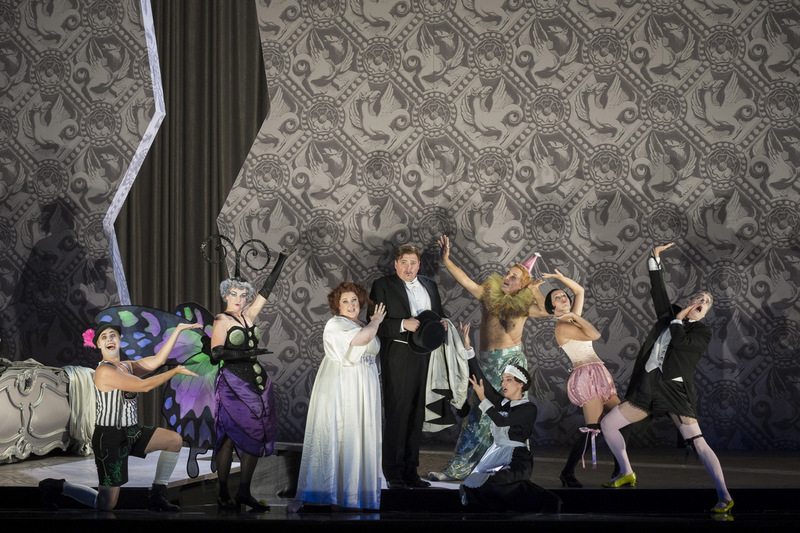 No matter how well they may sing, Johann Strauss Jr’s operetta Die Fledermaus requires its singers to act. Although the music may be irresistible, I haven’t fully surrendered to any of the Fledermice I’ve seen. No wonder it was usually done in English in the past (if memory serves: as it was a long time ago), as the skills were probably beyond the casts assembled here. It’s therefore a great pleasure to be able to proclaim the excellence of the Canadian Opera Company production that opened tonight at the Four Seasons Centre. It’s deep and it’s funny, it feels a bit decadent, and has undertones of madness & violence: just like our century. Director Christopher Alden rips off the surface of this comedy of class disparity, exposing the disturbing psychological underpinnings of that wild & wacky period between the rise of Freud on the one hand, and the onset of fascist madness on the other. While these images have been seen before, Alden, working with set designer Allen Moyer and Costume Designer Constance Hoffman, give us just enough gravitas to make these deeply satisfying laughs. This is the best production from the COC in awhile, and possibly the best thing I’ve ever seen on the Four Seasons Centre stage. Moyer dangles the key image above the stage, namely a pocket watch. The watch signifies time of course, where the chronological framework of the story sets up a dreamlike assumption of new identities. We’ve seen this sort of thing in stories such as Cinderella, where the dream represents a kind of wish-fulfilment, ended again by the arbitrary passage of time. The watch signifies at least two other things. Eisenstein carries a pocket watch, which plays an important part in the intrigue. But for me the most powerful –and additional –meaning Moyer and Alden find in the watch is the association to psychiatry. Alden says in his program note (although it’s beautifully clear in the staging) that “Dr Falke seems a lot like Dr Freud as he invites Rosalinde, Eisenstein, Adele and Frank to the dreamy libidinous party”. 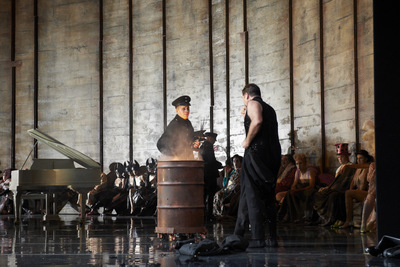 Falke wields his watch at key moments even though his control is as unnecessary as the superficial plot mechanisms Wagner uses of a love potion (Tristan und Isolde) or a curse (the Ring cycle). We are watching a story about dreams & wish-fulfillment, where the good doctor helps each of these people explore their hopes & expectations. No wonder, then, that Alden employs more bats than the Toronto Blue Jays, exploiting the overtones of something nightmarish and scary to probe deeply into this pleasure-seeking milieu. But don’t get the wrong idea. I would say it’s Constance Hoffman’s costumes as much as Moyer’s sets that set up this story, pulling it all into a wonderful parable about repression and truth. Aided by the most impressive performance from the COC chorus since War & Peace, we visit a laboratory of dreams, where all our modern ills are grown for study or perhaps amusement. I hope I haven’t given too much away, because the show is full of surprises, a few of which I stumbled upon via social media. There are several wonderful portrayals with two upon which the entire evening rests. In the first scene Tamara Wilson & Ambur Braid are instantly real, their German dialogue compelling as we’re instantly plunged into their dramas. Although the stage will fill with personnel and imagery, we never really lose our interest in them. While there will be diversions throughout, it’s their show through and through. I wasn’t at all surprised by the excellence Tamara Wilson brought to Rosalinde, a young woman with a wonderful voice that can be powerful or delicate, and with a genuine flair for comedy. But Wilson was matched by her maid Adele as portrayed by Ambur Braid. I’d been expecting to enjoy this portrayal, but was not prepared for how fully she inhabited the maid- who- becomes –Olga. While I’d seen the photos in the publicity, I was unprepared for the power (and comedy) of her transformation from the ugly duckling of Act I into the seductive Olga in Act II Her rendition of the laughing song had a delightfully angry edge to it. But the excellence doesn’t end there. Michael Schade brought his usual fluid German and effortless singing to Eisenstein. James Westman was a suitably embarrassed Frank, Peter Barrett, a constant presence (especially when he was hanging above the stage) as Dr Falke, and Jan Pohl, able to steal the show whenever he wanted to as Frosch the jailer; he was a troubling spectre of what was to come, giving the part a decidedly brown-shirted aura. Laura Tucker’s Prince Orlofsky was among the most successful among several examples of performed travesty, on a stage full of ambiguities. Sets blended one room with the next, costumes were flipped off or pulled on at will, aiding Alden in creating the sense of subjectivity & dreams. Conductor Johannes Debus & the COC Orchestra are their usual excellent selves, ably supporting a reading that never let the serious moments onstage hijack this joyful score. We never forget for a moment that this work is all about fun & enjoyment. I am expecting Die Fledermaus to be a huge hit, and look forward to seeing it again with Mireille Asselin who assumes the role of Adele for half the remaining performances. This entry was posted in Reviews and tagged Ambur Braid, Canadian Opera Company, Die Fledermaus, Johannes Debus, Strauss, Tamara Wilson. Bookmark the permalink. When are you going to see Mireille?